Grand opening sale at Yogurty’s. 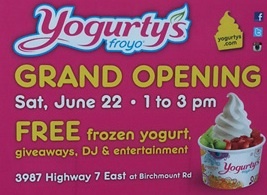 Free frozen yogurt for everyone, giveaways, DJ & entertainment at Yogurty’s Markham on Saturday June 22 from 1 to 3pm. Only valid at 3987 Highway 7 East at Birchmount Road.